I think the last time I did What I wore Wednesday it was my How I like to wear jeans post about Levi’s. I’m a slacker, I need to be better about this. But hold onto your hats, I have a new one. This is What I wore Wednesday corduroy + stripes. Before I get into detailing the outfit I want to tell you something. Usually when there’s a photo of me on my blog, someone who is not Viktor takes the picture. Viktor isn’t really into the whole posing, standing around, looking for better angles. He’d rather be tearing something apart somewhere in the house/garage/shed. These photos are (AWESOME HONEY!) a reflection of that. Did you know corduroy is totally having another moment? These aren’t the swishy, noisy, brown and orange corduroys of my youth; cords are completely adorable now. In fact, this pair of grey corduroy pants fit like skinny jeans. Love them. Wow, you rock that look! I love the color contrast! Yep, I did my marriage a massive favor when I asked a friend to take the occasional picture of me for the ol’ blog. Too funny. 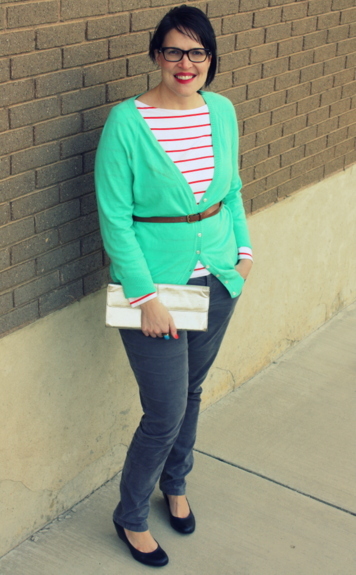 Love the stripes – so fun with the bright cardigan! 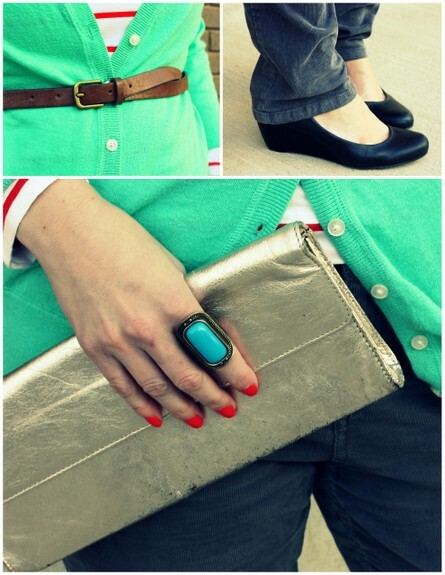 Lovin’ that color combo. Well-played! I really enjoy reading your blog! I just started mine and would love for you to stop by!